A new plaza honoring the Hon. Mike and Jane Sullivan will one day welcome students and visitors to the College of Education, with financial support from donors contributing to the project. The Sullivan Plaza will provide an anchor at the northeast corner of Prexy’s Pasture. 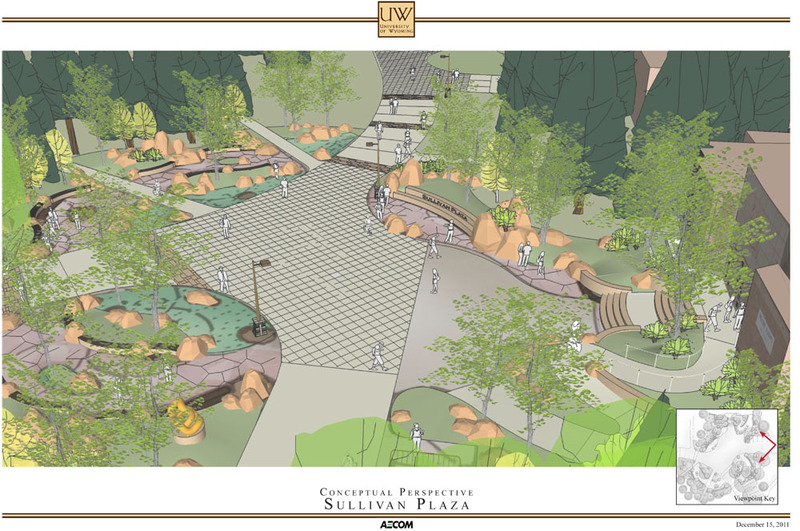 Following designs used to develop similar spaces honoring the Simpson and Cheney families, Sullivan Plaza will feature amphitheater seating, benches, Vedauwoo boulders and an array of native trees. It also will include a redesign of the Education Building’s front entrance. The project honors the Sullivans’ continued commitment to educational excellence and their many contributions to the University of Wyoming. Mike served as Wyoming’s governor from 1987-1995 and U.S. ambassador to Ireland from 1999-2001. Jane was Wyoming’s first lady. Gifts of $10,000 or more to the plaza project will be matched through a unique program offered by UW President Tom Buchanan, up to $350,000.